There are certain things that need special set of skills. Not everyone can come forward and try their hand and luck at them. It also holds true for vehicles. Every vehicle is created to serve a different purpose on the road, which is why we have so many segments and so many varieties. With advancing technology, we have now further gone ahead with very specific details as far as engineering is concerned. There are so many minute details that are now taken care of that no two cars in the same segment can claim to be engineered the same way. Every vehicle is specifically created to serve a certain purpose, and has a unique performance. When it comes to a long road trip or hitting the highway, we have a new star coming our way. The upcoming Land Rover Discovery Vision is just the car that will give you perfect company if you are one of those people who are found on the highway whenever they have time. It is a sturdy creation, one that can be trusted because of its promising additions. Even though it is just at a concept level that was revealed in 2014, there are a lot of hopes pinned on this one. 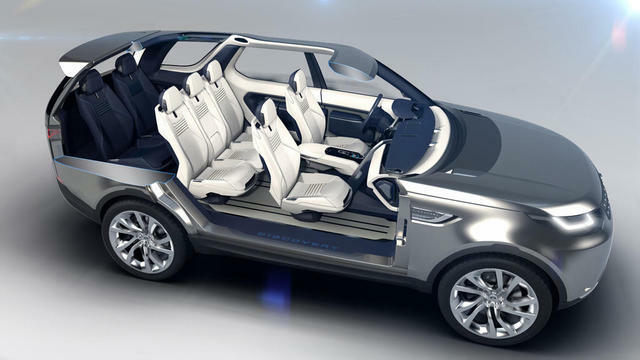 The upcoming Land Rover Discovery Vision can be your perfect partner if you have a thing for tricky stretches. Though we do not know a lot of details, considering it was just the concept that was unveiled, a lot can be understood about this future head-turner of the road. It is expected that this versatile is capable of taking the biggest of road challenges in its stride. There was an innovative transparent hood that this new concept flaunts, which is a perfect blend of a camera and a display screen that familiarizes the driver with what lies ahead. It is perfect for rocky stretches and jungles too. Needless to say there are so many road trip lovers who just cannot wait for it to come their way already. Another important aspect about the upcoming Land Rover Discovery Vision is its unique Remote Control Drive. It is the latest system that offers next level access to the driver who can be given access to a control that can be conveniently detached from the centre control system, which could be a phone or any other similar device. If stuck in a challenging situation, a driver can simply hop out of the vehicle and then use this control it to get it out to a safe spot. This is one of the most amazing features that the motor world is abuzz with. It has got people excited, especially those who always set out on expeditions and seek a vehicle that can tackle the rough roads that it might have to tread. Imagine this with laser-powered headlights that are one of their kinds. Clearly, with the upcoming the Land Rover Discovery Vision is on its way and there is no stopping it.